Three of the Baptist Park School students honored at MediLodge’s volunteer luncheon, April 18, 2015: Joshua Dawson, Ruth Doty and Amanda Storms. When the six high school students first met last fall in Nancy Van Alstyne’s class, “Music and the Mind,” they were skeptical. The goal of the yearlong course at Baptist Park School was to help create personalized playlists for residents of nearby MediLodge of Taylor, Michigan, a skilled nursing and rehabilitation facility. 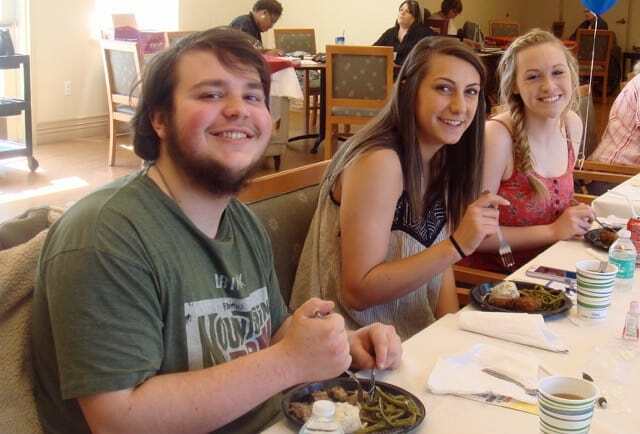 This past weekend, the six students were honored at a luncheon at the care facility, where they have spent hours each week helping to refine choices of musical favorites for residents. Those reflections bring tears to Nancy Van Alstyne, who has taught art classes at the private Christian school for 25 years. “Baptist Park has a real heart for service,” she says. This past year, following the death of her mother at 96 from complications of Alzheimer’s, Nancy decided to do something different. Learning of MUSIC & MEMORY® from friends after posting videos of her mother enjoying music on Facebook, she offered to volunteer at MediLodge and the school, in her mother’s memory, to bring personalized playlists to the residents. Working with MediLodge Social Services and Activities Director Jennifer Williams, Nancy did the preliminary research of identifying residents who would benefit from the program, then narrowed down their favorite performers and genres. The students would then sit with one of the residents, using a splitter so all could hear, play different selections from a given artist, and note the resident’s reactions to see which song got the strongest positive response. Armed with that research, Nancy created the playlists. There was the Polka Lady who loved her Polish folk tunes, and the man who loved to hear Elvis singing gospel. Others favored Johnny Cash, Motown (not surprising, given that Taylor is just 15 miles south of Detroit), Frank Sinatra, the Lennon Sisters and the Andrews Sisters, Duke Ellington and the Norman Luboff Choir. Jennifer and Lucy Moberly, a Trenton High honors student, with iPods and iTunes cards that Lucy donated to the Baptist Park School program. The experience has had a profound impact on the students. In June, participating in The Longest Day—a 16-hour marathon fundraising event for the Alzheimer’s Association—Joshua plans to train other students how to do what his class has learned. Employees from MediLodge will also participate in the event, and Nancy will be showing Alive Inside, the documentary about Music & Memory, several times throughout the day to raise awareness and enthusiasm for MediLodge to consider becoming a MUSIC & MEMORY® Certified Care Facility. Nancy hopes to draw not only on the Baptist Park student body to volunteer for The Longest Day, but also on students from nearby Trenton High School. She has a good connection: an honors student from Trenton High, Lucy Moberly, did a service project to help the Baptist Park Music and Mind class by collecting iTunes cards and used iPods. It was her mother, Jennifer Moberly, who first told Nancy about Music & Memory. As she looks back on this year, Nancy often recalls her mother, Millie Barkalow Peterson, in her final days, and the joy she derived from music while in hospice at another area nursing home. “She would sing ‘Jesus Loves Me’ and ‘In the Garden’ with such delight, with the music therapist,” says Nancy. Enabling her students to bridge the generational divide and discover the power of personalized music has brought her a great sense of accomplishment.